The spiritual and emotional journey of a mother of two young children following the death of her husband. 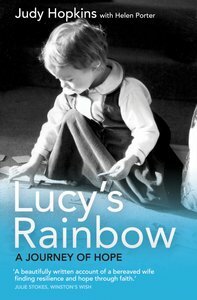 Lucy's Rainbow is the powerful, heart-wrenching story of a young family torn apart by cancer. In this inspiring personal account, Judy Hopkins penetrates the depth of human suffering, depicting for us as honestly as possible a grief which is finally beyond words. Judy Hopkins was born in Wellingborough, Northamptonshire. She qualified as a registered nurse at Addenbrookefds Hospital, Cambridge, in 1981 and worked as staff nurse on a leukaemic ward before training as a midwife at Cheltenham School of Midwifery in 1982. From 1983 to 1985 she studied at the London School of Theology, gaining a Cambridge Certificate with credit in Religious Studies. Judy has worked for many years in hospice care and spent two months in Uganda helping in clinics and mission. She has experience in public speaking and has established and led various groups in a voluntary capacity at church and in her local primary school. Judy lives in Bishopfds Cleeve, Gloucestershire, with her two daughters, Rachel and Lucy.